Whilst the maximum flow condition dictates the capacity of the flare tip, the available tip pressure drop will define whether the flare tip is of a sonic or subsonic design and therefore have a greater influence on the actual flare tip design and its construction. 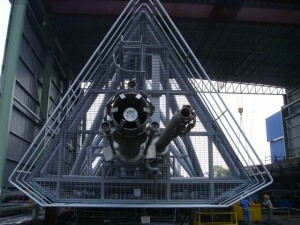 For subsonic utility pipe flares stable flaring is typically limited to flare discharge velocity of the order of 0.5 Mach with excursions up to 0.7 Mach when combined with suitable flame retention devices. Sonic flares on the other hand are designed to operate with much higher pressure drop and are able to utilise the additional gas momentum to increase the smokeless operating range by inducing a larger volume of air into the combustion zone.